Below is a review in two voices—much as the book is a story told through several. Differentiated less by opinion than typeface. I opened my pre-ordered copy of “The Ministry…” with a bit of trepidation mixed with skepticism. Like many others, I had read the reviews—the plethora of good ones and the few unsure ones and the very few outright scathing ones—and I was determined to make up my own mind. But in the case of anything by Arundhati Roy, it’s hard to not mix up the woman with the words. The prose is of course undeniably lovely, and makes us see a well-known city in ways that otherwise would totally escape us. Arundhati Roy’s second novel follows 20 years after her first one, The God of Small Things. She spent the years in between as an activist, campaigning for the rights of the marginalized. 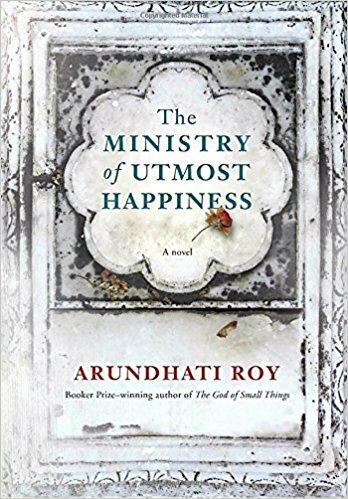 The Ministry of Utmost Happiness is a story told in two parts and three voices, with two sets of characters that come together in a quick finale. But that’s getting ahead of ourselves. We begin with Anjum-born-as-Aftab, who, finding herself in the wrong body, embarks on a journey of reinvention, first joining the gharana of Ustad Kulsoom bi in Khwabgah, the house of dreams, and then moving into her own palace of dreams-come-to-life—Jannat Guest House. Anjum collects around her a medley of marginalized humanity: the persistent and secretive Saddam Hussain, the seductive Nimmo Gorakhpur, the abandoned-and-adopted Zainab. The story then pivots around the discovery of another abandoned baby, in JantarMantar, in the middle of a nationalist moment. Now we hear the voice of Landlord, a failed civil servant and relapsing alcoholic who introduces us to Tilottama, the protagonist of the second part. Tilo’s journey takes us all the way from a barsati in South Delhi to a houseboat in Kashmir to a nursing home in Kerala. Roy’s story weaves together the complex—and continuing—story of a shattered subcontinent and its deep, irreparable wounds. She gives us glimpses of the extreme callousness and extreme generosity that make the present, the hope of the protesting crowds in the capital, and the hopelessness of those who resist the state—whether deep in the forests of middle India or in the hills and valleys of the north. Roy’s prose is often poetic, and the book is a pleasure to read. Except for the times when Roy the activist creeps into the novel. When Tilo leaves her Delhi home, and the Landlord looks through her things, he finds a notebook where she details case after case of torture and killing in Kashmir. Roy had already made this point—very effectively—in the narration of the Kashmir story. There wasn’t any reason to add so much detail—in fact, it detracts from the power of the story. It also makes the Kashmir section so long that I was wondering how she was going to pull the different strands together. And then there is a long letter from a woman who had joined the Naxalite movement (a left-wing guerrilla movement). Here again I felt Roy wanted to make a point about the injustices faced by women guerrillas—a worthy point but unnecessary to the story. At times the ghosts of the God of Small Things walked softly across the page, making me wonder about connections—in the mind and in the heart. Does some aspect of Rahel grow up to be Tilo? Is Maryam Ipe an older, more shadowy, version of AmmuIpe? Do the Love Laws still haunt us, and the pages of this book—where the laws are instead flouted with a nonchalance that is hard to ignore? I felt the end came together too neatly. In a sort of “they all lived happily ever after” kind of way, despite the histories that will not be forgotten, the cruelties that continue to be felt. A one-room apartment on the rooftop of a house. Good review of the book. I agree with you – the extensive details of the notes in Tilo’s apartment and the letter from her mother were very long and distracting. I read the book over many days and had a hard time remembering all the various strands of interwoven stories. But it all came together well at the end in a way that made sense. The brutality of the Kashmir conflict was hard to take – we are so far removed from the history of that region and the media have kept much of it under wraps. Thanks, Shashi. I’ve lent the book to a non-Hindi/Urdu speaker, so we’ll find out! Yes, the brutality is hard, but some of the Hindi movies have covered it in their own way. Have you seen Haider? Would recommend it–Vishal Bharadwaj’s take on Hamlet, set in Kashmir.